Thick and rich hot sauce with a blend of chile peppers, tomatoes, and spices. picopica. Real Mexican Style Hot Sauce since 1937. 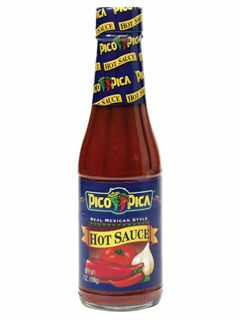 Pico Pica Hot Sauce a favorite on eggs, tacos, soups, meat and fish. Ingredients: Water, Chile peppers, Tomato puree, salt, spices, cottonseed or soybean oil, citric acid, xanthan gum, garlic powder, paprika and sodium benzoate as a preservative. Pico Pica Hot Sauce o salsa picante es una deliciosa y muy tradicional salsa Mexicana a base de tomates, chiles y especias. Although nothing will ever beat the taco shop hot sauce I grew up eating in California, Pico Pica comes close. It's not vinegar-y like other common bottled hot sauce. It's simple, spicy and salty. It is the perfect Mexican-American hot sauce to keep on hand in your fridge. So happy to have found it online to give me a little taste of home. Pico Pica puts a special zing in our Taco Night (every Friday)--so glad it's available from MexGrocer.com! Best table salsa around...been using it for over 30 years. Great balance of flavors. Can't find it where I live anymore. I have Pico Pica running through my veins. Discovered Pico Pica in 1985 and today it is still my favorite hot sauce. I use about 2-7oz bottles a month! Local retailers have stopped stocking Pico Pica so I purchased a case (12 bottles) today before they were gone! I wonder if I could get a Pico Pica Intravenous hook-up at a Insta-Care hospital when my 12 bottles run out. ProsBest Hot Sauce bar none! ConsAs of 9-11-18 hard to find locally. This has been a staple in my family since I was little. My Mom poured it on french fries and now I do too! It's great on just about anything (except salad and desserts)! Popular in SoCal, it's hard to find East of the Rockies. So I import it every few months. Yummy! I can't find it in any store (North Idaho) Amazon says only X left, order soon, I have emailed the company, I called the company, no response. Anybody know what's going on? There's nothing else on the shelves that is even acceptable. I used to buy this in Baldwin Park California, After moving home to Missouri I couldn~t find it anywhere. i googled it the other day and found mexgrocer, I won`t be without it ever again! ProsIt doesn`t get any better. Best hot sauce I have found. I have been using Pico Pica hot sauce for years and in my opinion it is the best hot sauce available because it has just the right amount of spiciness and I love the flavor. I�€™m disappointed that it is not readily available in grocery stores. Quick, easy, to my door and hot going down! the grocery stores where i live in florida don't carry my favorite hot sauce pico pica. but luckily mexgrocer delivers it right to my front door. thanks mexgrocer! I have been buying Pico Pica for decades but now that I live on the East Coast it is difficult to find so I have to order it on-line but it is worth the wait. As the multitude of reviewers have attested, Pico Pica Hot Sauce is delicious. I was raised on it and I can't eat tacos without it. Or burritos, or eggs, or any meat at all, or... You get the idea. It's hot as it should be, but it is also a sauce. Not loaded with vinegar so the flavor of the chilies really comes through. I haven't found anything even close. For whatever reason our markets here in the islands quit carrying it this year. So we were sure happy to find MexGrocer. Just wish they would sell the gallon jug of Pico Pica that the manufacturer offers to commercial clients. ProsFound out the product was too hot. Gave it to people who appreciated it. ConsLost money, but made new friends. I'm 46 and I have been eating this on my homemade tacos for years. My parents bought it when I was a little girl in El Cajon! I live in WV and my whole family loves it! My wife was introduced to this by a friend from California many years ago. Where we live now it is not available so we are pleased that we can get it online. ProsNothing but good things to say!! This is the BEST taco sauce ever!Nothing matches it. I am 63 and remember the first time I ate it at a taco stand. Hooked ever since. Sad it is no longer in the market, but happy to find it here! Company is fast and accurate. The product is exceptional! Best bottle table salsa in the world. I've tried them all, and Pico Pica Hot Sauce is the best I've ever had. Unfortunately, I can't get it at any of the grocers in my area any longer, so I have to order it online. Thank you for carrying this wonderful salsa. ProsVery balanced flavor...most salsas are too heavy on the vinegar or other ingredients....this one is balanced. Excellent flavor and not too hot. I can not find it where I live and really appreciate being able to buy it at MexGrocer.com. I am 61 yrs old and I've always eaten this on my tacos. I love this sauce. Thank you for carrying it and shipping it to me. I have had several people in Oklahoma start ordering it from you. Thanks again. We got hooked on this in California and I'm so glad you carry it, can't find it ANYWHERE in Midwest! Just Awesome!!! Love this sauce, great taste. I put it on/in soooo much. & it is low is sodium. ProsAlways quality product and prompt delivery. ConsThat I have to order it on line now. It is not being carried anywhere. I use this hot sauce on steaks, in soups, and on pork chops. Like so many that have moved east....we all experience Pico Pica withdrawal since it is not in the stores here. So glad to find MexGrocer. I am stocked up once again with my favorite sauce. I first tried this when I worked in a restaurant in Santa Barbara in the 80s and was immediately hooked! I've been living back in England for the last 26 years and am unable to buy it in any shops or online. I have to ask friends who are visiting California to bring me some back and then I hide it from the rest of my family!!!! My all time favorite hot sauce. It has the right amount of heat and great flavor. Can't find here in Phoenix. So happy to be able to order from MexGrocer.. It is a sad day when we use our last bottle. It is a must have! Been using for thirty years! This is by far my favorite hot sauce, with a slightly smoky flavor and no sharp vinegar tang (like most others). I can no longer find it in my local grocery stores, so I gladly order it online. ProsGreat, consistent flavor. Small bottle fits nicely in fridge. ConsCrust at the top of an already-opened bottle occasionally falls into food. Been using this hot sauce for many year. ProsThe best Mexican hot sauce there is. ConsOrdered 9 bottles and only received 8 bottles. Been using this since the 70's, was 47 cents a bottle, sometimes on sale for 29 cents, but still same great flavor now. ConsNot available on East Coast of US. Pico pica never let's us down. PICO PICA HOT SAUCE GOES GREAT WITH ALL TYPES OF FOOD FROM BREAKFAST, LUNCH, TO DINNER. This is the hot sauce for those of us who don't like vinegary sauces. The flavors of the chiles and spices are what you taste, rather than the spoiled taste of vinegar. It has just enough heat to impart a mild burn/tingle, but it's the flavor that keeps me coming back all these years. I send it to fellow hot sauce lovers all over the country because of its limited distribution. ProsNo vinegar. Bright, bold chile pepper flavor. Best hot sauce I have had! I have tried many types of hot sauce and this one is by far the best. It goes good with any thing. Once you've tried it you will agree. ProsNot too hot Doesn't require "refrigerate after opening". Have used this sauce for many years. In my opinion it is the best hot sauce. Wish could purchase in this area (N.E. Ohio). I grew up on Pico Pica. This is by far my favorite hot sauce. I just wish MexGrocer had a more reasonable price so I could buy more of it more often. I was raised in California and grew up eating pico pica hot sauce on the best taco's made by my mother! Pico Pica is so good and has been passed down as the favorite hot sauce to the next generation in our family. Our friends in Illinois have us ship it to them. It is great in soups, on egg burritos - however you want to eat it! Yum! This the best ht sauce ever made! Can't live without it! I am originally from California. Have lived in Nebraska and now Pennsylvania. This salsa is impossible to find in the markets. I'm happy to be able to order it here. I have it in my pantry at all times. Not the usual hot sauce taste, I don't care for the vinegar taste in the 'southern' hot sauces. This is a toasted chilie taste. Excellent on everything! I have been using Pico Pica for 30+ years. I have had it shipped everywhere I have live outside of the US and actually wonder what my world would be like without it. Pico Pica is in my blood. ProsBest bottled hot sauce ever. WHAT TONY THE TIGER SAYS, " ITS GRRREAT"
HAVE BEEN USING PICO PICA MEXICAN HOT SAUSE FOR YEARS. ITS GOT THE BEST FLAVOR & TASTE OF ANY I'VE EVER TASTED. I PUT IT ON EVERYTHING. YES, EVERYTHING. ITS A LONG STORY, SO I'LL JUST TELL YOU I HAVE PUT IT ON VANILLA ICE CREAM, AN IT WAS GOOD. HAD TO BE THERE. BEST HOT SAUCE ON THE MARKET. I LET EVERYONE TRY IT.